What an interesting card. We have what looks to be a dominating and authoritative woman….power and control radiates from the way she looks and is poised in this Cosmic Queen of Swords! I sense strength but also coolness in her demeanor. In the background beyond the pillars, we have a full view of the passionate couple in the Lovers. I wonder if this is the gateway, the door to our unconscious motives. And that she uses her past as a resource to guide her decisions now. I also get the sense of this with the checkerboard effect seen around the window. A powerful force of mind and matter = creative energy. Hmm, MC2? Also a pointed archway is higher than a regular window, so it lets in more light. Interestingly, the inside is more open and the walls not as stressed because the skeleton of the building is outside. Yellow is her predominating color, a color that awakens our brain cells and helps to process our thoughts. It helps to release our burdens from our mind. Then, our thoughts can flow with the cosmos giving us flashes of intuition. Her sword leans to the right, an original and exhilarating mind that never tires? This woman definitely looks as if she takes charge and get things done. I would consider her very dependable and reliable as a friend or coworker. She’s not one I think to mince words….she’ll give you feedback whether you want it or not. Only those closest to her would know the sacrifices she’s been through to get here. But these sacrifices have fueled her with an immense energy. Single-minded and focused, her goals and reputation are important to her. Her creative abilities help her to reach her plans and goals. I bet she has a Ph.D after her name, which appeals to her more than beginning with Mrs. So and So. This woman is so driven, she will have to take care at times not to lose her sense of compassion and learn to work in a supportive environment. I have a hard time warming to this card...every time it comes up, I think 'oh no, not her'...! I think the Lovers in the background was a relationship she once had, maybe a marriage that ended in divorce. This is what is driving her presently, the emotions she never got over but is hiding behind that stoic presence. The sword is so clear; you can't try to manipulate her! She's been thru it all and nothing surprises her now. Too busy living in her head, in the past...she scoffs at the idea of "love". When I get this card I think of my mom, who's a Libra (air sign) who has been divorced and can't be fooled! I think more or less the same here.Either a marriage,or a choice,thats hurt her more than she thought would,and its that what now keeps her from letting anyone too near again,her sword lays across her heart now,and thats all. The actress depicted on this card is Ingrid Bergman, which is apt. Bergman's role as Joan of Arc was very important to her. 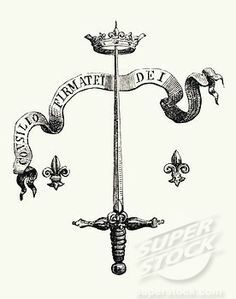 And Joan's own emblem was the crowned sword. She is often depicted with a sword. There is even a sword shown in a church which is supposed to have been hers. She was also very courageous and had her own mind, and didn't follow the conventional ideal of femininity. And also Bergman herself, trapped in her saint image as she was, broke it and embraced scandal instead. This is maybe one of Loesche's most inspired choices IMO. It shows that his choice to depict Hollywood characters was not some gimmick (a tarot with celebs!) but an effort to seek for archetypes of the 20th century.